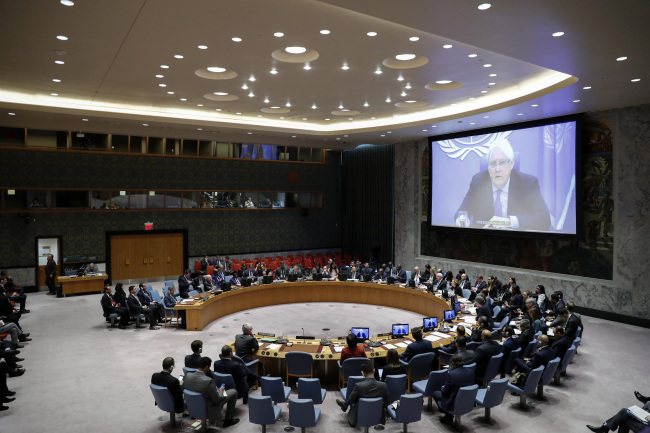 The UN Security Council Sanctions Committee on North Korea has granted exemptions from the sanctions to four organizations, it was revealed Tuesday. According to the committee, Christian Friends of Korea, the Eugene Bell Foundation, First Steps and UNICEF were given exemptions that took effect Jan. 18. Christian Friends of Korea is a US-based organization that has been providing humanitarian aid to North Korea since 1995, and First Steps is a Canada-based Christian organization that focuses on addressing child malnutrition in the North. In the latest approved project, UNICEF has been given the green light to send items to hospitals treating tuberculosis, including nine ambulances, 17 laptop computers and 40 televisions. The combined value of the items is about $520,000. The Eugene Bell Foundation has been authorized to send items including speakers and pens, the value of which has not been revealed. UNICEF and the Eugene Bell Foundation obtained their exemptions in October and November, respectively. It has not been specified which items Christian Friends of Korea has been permitted to bring to North Korea, but they will be necessary supplies for humanitarian projects involving tuberculosis, hepatitis and sick children. As for First Steps, the organization will be sending 300 20-liter stainless steel cans of soy milk. In a separate development, the Ministry of Unification on Wednesday denied reports that the US had opposed Seoul’s plans to send Tamiflu to North Korea, attributing delays to technical and practical issues. “The reports that the US has reservations about humanitarian aid such as sending Tamiflu are not true. Influenza treatment is a humanitarian issue, and the US has taken a positive attitude (toward the issue),” a Unification Ministry official said, saying the South Korean government plans to send the medication in the near future.